Generally speaking, each country or political subdivision has produced currency which enables the population to acquire goods and services without resorting to barter. Early civilizations rapidly learned that coins would enable commerce. These early coin producers often used gold and silver to produce these coins. This was a wise choice. Gold is hard to acquire and will last indefinitely. At the time it was not possible to fake it and it could also be easily worked with primitive tools. In addition it could also be easily subdivided into small parts. Silver was more readily available than gold, but also possessed many of these same qualities. Silver coins became the choice for everyday type activities, while gold was used for larger transactions. However, both gold and silver have a problem. Neither is strong enough to be used in coins as a pure product. coins hard enough to withstand the rigors of use. However, the value of both gold and silver was very high as compared to the value of human labor. create new coins (today our government still does this with paper currency and we call it inflation). the undoubted world currency is the US dollar, but that has only been true since the end of WW11. The Venetian Ducat was first introduced as a gold coin around 1300. By the middle ages it had gained a great following around the world and was extensively used for commerce in different countries. 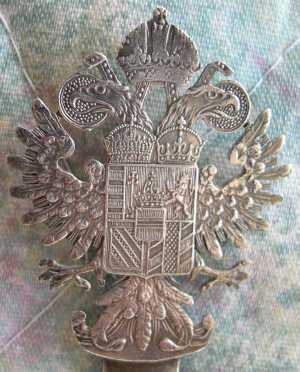 The silver ducat also gained great use throughout Europe and its trading partners. 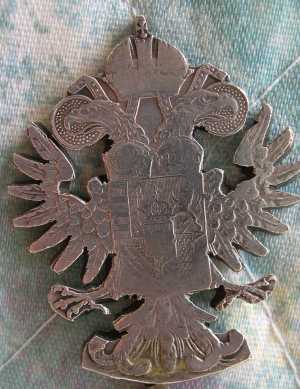 Many countries tried to imitate the Venetian ducat with limited success. The Maria Theresa thaler is a silver bullion-coin that has been used in world trade continuously since it was first minted in 1741. Named after Empress Maria Theresa ( Austria, Hungary, and Bohemia from 1740 to 1780). The coins are always dated 1780, but were most likely minted in different years. 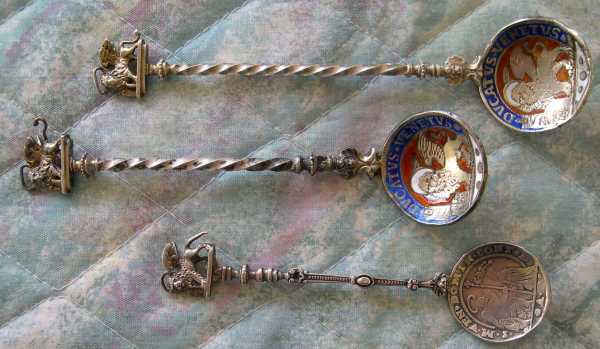 The top spoon (left finial picture) has the obverse of the coin cut out and mounted as the finial, while a complete coin is used as the bowl.